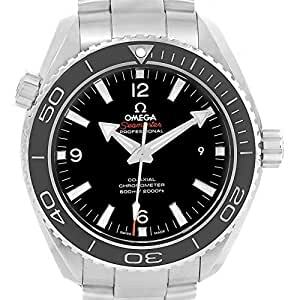 OMEGA SEAMASTER PLANET OCEAN 600M WATCH 232.30.46.21.01.001 BOX CARD. AUTOMATIC SELF-WINDING CHRONOGRAPH MOVEMENT WITH COLUMN WHEEL MECHANISM AND CO-AXIAL ESCAPEMENT FOR GREATER PRECISION, STABILITY AND DURABILITY OF THE MOVEMENT. SILICON BALANCE-SPRING ON FREE SPRUNG-BALANCE, 2 BARRELS MOUNTED IN SERIES, AUTOMATIC WINDING IN BOTH DIRECTIONS TO REDUCE WINDING TIME. RHODIUM PLATED FINISH WITH EXCLUSIVE GENEVA WAVES IN ARABESQUE. STAINLESS STEEL ROUND CASE 45.5 MM IN DIAMETER. HELIUM ESCAPEMENT VALVE AT THE 10 O’CLOCK POSITION. TRANSPARENT CASE BACK. BLACK CERAMIC UNI-DIRECTIONAL ROTATING BEZEL. DOMED SCRATCH RESISTANT SAPPHIRE CRYSTAL WITH ANTI-REFLECTIVE COATING. BLACK DIAL WITH LUMINESCENT INDEX HOUR MARKERS AND BROAD ARROW HANDS. SILVER ARABIC NUMERAL AT 12. DATE CALENDAR WINDOW AT 6 O’CLOCK APERTURE. SMALL SECONDS DIAL, AND A CENTRAL CHRONOGRAPH HAND. SIXTY-MINUTE AND 12-HOUR COUNTERS AT THE 3 OâCLOCK POSITION. STAINLESS STEEL BRACELET WITH DEPLOYENT BUCKLE. FITS 8 1/4″ WRIST.. SKU 20070. BUY WITH CONFIDENCE KNOWING EACH TIMEPIECE GOES THROUGH THE SAME RIGOROUS 31-POINT INSPECTION. REST ASSURED ONLY AUTHENTIC PARTS STRAIGHT FROM THE MANUFACTURER ARE USED. THE CERTIFIED PRE-OWNED PROGRAM ON AMAZON ENSURES PEACE OF MIND AND TRANSPARENCY VIA STANDARDIZED REPORTS AND A 1 YEAR WARRANTY PROVIDED BY WATCHFACTS.